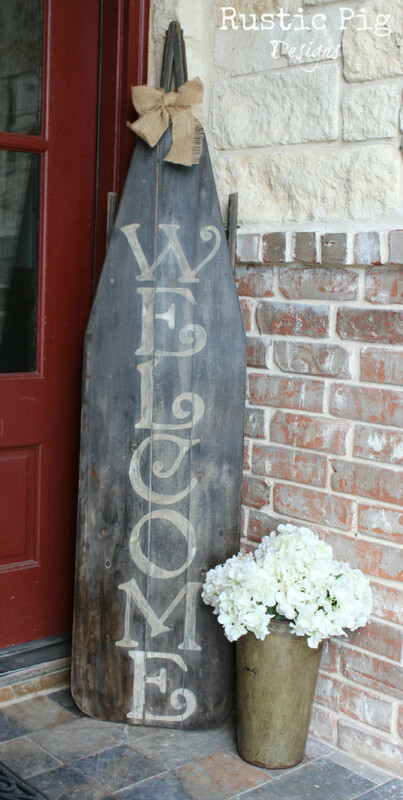 When I saw The Rustic Pig's Ironing Board turned Welcome Sign on Pinterest a while back I loved how it looked propped up on the front doorstep. I have been keeping my eye out at the flea markets and thrift stores for an old ironing board, but that has been an impossible mission. But then, on one of my many trips to the Ikea “as-is” section (although this happened to be the same trip I also picked up the cabinet door I used for the kids' backpack station) I saw this long tall door for only $2 and I knew it would be perfect to convert! My original idea was to stencil the word “Welcome” on it in black and call it a day, but I decided I wanted more of the aged vintage look like the original. Instead of just painting and distressing it with sandpaper, I decided to use the school glue crackle finish technique I used previously on the pair of boat oars that went into the nursery. I lived with it for a couple days, but there was something about it that bothered me. The high contrast in the paint didn’t truly look old, especially the bright white letters. So I sanded the edges with some fine grit sandpaper and then I watered down some brown paint (Burl by Martha Stewart from my bathroom cabinetry) and gave the entire thing a once over. 1. Give the surface a quick coat of oil based stain and quickly wipe most of it (you want it to still be a little damp. 2. Working quickly, splatter it with water based paint and immediately wipe that off with a slightly damp rag. I set it back on the front step, but I loved it so much I decided to try it out in some other locations. I love how it came out, especially since my total investment was less than $4. This turned out amazing! I really like it hung inside the house, too. Very, very cool! The sign came out great!! check out your blog too! Love the weathered look. It's a great project. Wow. I love this welcome sign! Thanks for explaining all the different steps you took to transform and IKEA door into something that looks antique! What a great use for the IKEA as is section! It came out great. Love it! You totally rocked the weathered look!